Dr. John Jain is a Board-certified reproductive endocrinologist with 20 years of experience. 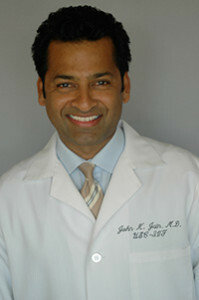 Dr. John Jain is a Board-certified reproductive endocrinologist and a pioneer in the field of reproductive medicine. He was federally funded by the National Institutes of Health and was appointed to the National Ethics Committee of the American College of Obstetricians by President Vivian Dickerson. In 2006, the Pacific Coast Reproductive Society awarded him their top research prize. Dr. Jain has twenty years of academic experience including a decade as a decorated professor of Obstetrics and Gynecology at the USC Keck School of Medicine. During his tenure at USC, he spearheaded egg freezing research and subsequently created the university’s egg freezing program. He now brings that expertise to Santa Monica Fertility. He remains dedicated to advancements in the area of cryopreservation through cutting-edge research at Santa Monica Fertility. Dr. Jain completed his BA in Classical Greek Civilization, MS in Anatomy and Cell Biology, and MD from the University of Southern California. He completed his specialty training in Obstetrics and Gynecology and subspecialty training in Reproductive Endocrinology and Infertility at the University of Southern California where he remained a full-time faculty until 2007. Egg freezing, early embryo development, embryo implantation, fertility in women of advanced age, egg donation and surrogacy and uterine receptivity.